personal cabinet, clear and reliable reports, accounting. instant autodistribution to the nearest board of a taxi. loyalty programs, voice and auto information. The main function of the program for taxi order reception. When you call the customer, an order card opens. The card will display all the basic information about the client: phone number and customer name, history of its previous addresses, preferred options, bonus balance, customer rating. After the dispatcher specifies where and where the customer will go, the cost of the trip and the approximate time of waiting for the car will be calculated. Also, to order a taxi, a client can use a mobile application. In the event that the control room is experiencing a shortage of operators for receiving calls, you can enable the function auto-order. After the operator has saved the order, it begins to be distributed to the drivers. Distribution algorithm is set up by the taxi order manager. The distribution criteria include the driver’s distance to the customer, the driver’s time without work, the driver’s rating. The driver receives the order in his mobile application and decides to take it or refuse. The driver sees the tariff, the price of the order, the address and the distance to the client calculated on the roads, taking into account the prohibited turns. 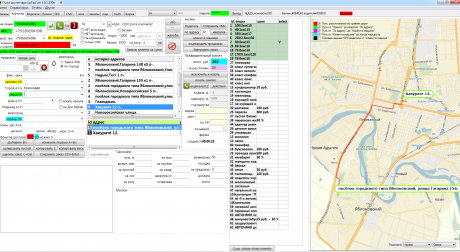 In the program there are all popular costing mechanisms trips such as taximeter, calculation of a fixed price on roads, calculation of prices by areas or zones, price surcharges for zones. The taximeter is a very flexible mechanism for calculating prices that allows you to take into account the cost of a trip depending on the traffic situation in the city. The taximeter has many settings that allow a very flexible calculation of the price taking into account the interests of both the driver and the customer. The UpTaxi program is optimized for quick receipt and ordering. For reception of a call and opening of a card of the client it is enough to press one button. For convenience and faster receipt of the order, there are hotkeys for all actions of the dispatcher. Addresses can be entered from the address classifier or from the client address history. If the address does not exist, you can enter it manually. After entering the travel addresses in the card, the cost of the trip, the length of the route, the average time of the delivery will be reflected. The travel addresses and the route between them are displayed on the map embedded in the order card. Gone are the days when the operator called the customer and invited the client to the car. Now work robots. Built-in program autoinformer will call the client and tell about all the changes for the order. You can also connect SMS informing. Choosing work with the program UpTaxi you get a whole range of tools aimed at providing high-quality taxi service. The program has a huge functionality that allows you to effectively save your time and money by automating business processes of taxis. A big advantage of our program is the distributed Call-center. The distributed Call-center is inherently the exchange of calls. UpTaxi system now has 8 Call-centers, all of them are competitors among themselves. This approach allows you to buy the Call Center services at the best price, choosing the appropriate quality. At the same time, you can connect all Call Centers at the same time, setting each priority. At the same time, if you have your own operators, you can become a Call Center and earn free time for operators. The program of automation of taxi services UpTaxi consists of many modules that cover all business processes of a taxi. This is not only the reception of the order by the operator and the fulfillment by the driver, but also the ready-made schemes of development. The program embodies the experience gained by years of successful taxi dispatch services. The program confirmed its efficiency at real loads: about 10,000 orders a day, 550 drivers on the line. The serviceability of the program is monitored by the monitoring system and in the event of abnormal situations, technical support is notified, and if necessary, the customer’s representative. The UpTaxi taxi program is a cloud-based solution for the automation of any dispatch service or taxi park. We do not sell the program modules, packages or anything else. We provide access to the full functionality of the program for a certain percentage of its use. In fact, the cloud option means the lease of software, i.e. the program itself is not sold, it is located either on the remote server of the company, or on the client’s server. The variant of placing the software on its own server is discussed individually. Our percentage for using the software is automatically deducted from each successful order (write-off from the driver) carried out on our program. The interest is charged throughout the period of use. In the section Prices The conditions for granting access are set out. It is important to understand that the calculation directly depends on the number of orders per day. This approach, combined with the test period provided by us, allows you to open your own control room with minimal investments or to smoothly change the security if the business is already working, but the software you are using does not satisfy you. UpTaxi is a relatively young product, but this is its undeniable advantage. It takes into account all the needs of modern services, is functional, withstands colossal loads and at the same time, the software is very plastic. We, of course, are proud of the created product. It is based on the principles of fairness and the maximum benefit from using the system. The interests of all players in the process are taken into account: management – personnel – client. The product is convenient and easy to use, understandable and financially accessible. More than five years ago, Dmitry Osadchy founded a taxi service in Belgorod. “Alliance” (Dmitry’s service) began, like many others, on radio sets and tapes in a notebook. After a while, Dmitry transferred the firm to their first software. Providing supported a minimal set of capabilities, so the first automation was barely enough to control orders. But the technologies do not stand still, and the competition in the market of passenger transportation of any city requires a high level of service in connection with which they started moving on. The next for the “Alliance” was the English program. “At that time we were like aliens from outer space for passengers. The English are good, only representatives in Russia have failed, and nobody wanted to make changes for a concrete city. In general, again the question arose about the search for a new software. It was necessary to competently compete with “networkers” and their dumping. I wanted everything at once, and it turned out with UpTaxi. Thanks to UpTaxi, we entered the market with a hybrid mode of operation. The client wanted to know the fare, and we gave him that opportunity. Moreover, it is not easy to know, but to travel at this cost, which immediately increased the number of orders. On small volumes, growth was felt very strongly – for five months, they increased by key indicators by 70%. “In the previous software, there was a lot that was not there, or it was poorly implemented and worked out for a long time. Those. there was practically no support, but most importantly, we could not get from them those moments that we needed: we asked to make bonus programs for customers, for drivers. And did not wait. The transition to a new program in the taxi business is a process that is always painful and emotionally complex. Staff is skeptical about the new. And who does not? At Evgeny’s service, the adaptation period for dispatchers took about 10 days, and the company completely “got on the rails” in a month and a half. Some may think that this is a long time, but, as the results show, it is more than justified! “Since we have never worked with the stock exchange before, I can mark it separately. Now we are working, we like it. Auto-allocation of orders – immediate appointment of the driver. It even happened that the customers asked: “Why did you send me a car so early?”. “Until now, if any problems arose in the work of the program, those. support fixed everything quickly. Therefore, I do not think I will complain about specific shortcomings. For all time working with UpTaxi nothing was noticed. Oleg Alexandrovich, owner and head of the taxi service “7-40” ectaxi.zp.ua, Zaporozhye, Ukraine.His path to success, Oleg Alexandrovich began in 1999. Over 16 years of development in this field, Oleg Alexandrovich has accumulated invaluable experience and knowledge, which now allows us to overcome the difficulties associated with the economic situation in the country and chaotic competition in the city. “The taxi market in Zaporozhye is very dense. Let’s just say, only a lazy person does not work a taxi or does not consider it necessary to open his service, tk. here there is a stereotype of fast money in this area. Many virtual services. As a consequence, chaotic and stupid competition. New taxi business players enter the market with crazy dumping. Cars and maintenance at the same time leave much to be desired, and profitability is zero. In a word – piracy. The UpTaxi program became the 5th software for the “7-40” service. “We looked at everything, but especially important was the work with gps -sa-meter, navigation, referral systems, cartography. Of course, the service was also an important selection parameter for us. Very pleased with the open dialogue with developers and support – this is a big plus. False desires are eliminated in the discussion, only really necessary and important moments and tasks remain. Like that guys quickly respond to our needs, correct mistakes and refine by request. UpAxi does not have any complaints. If there were, I would have long begun to sound the alarm, “pull” the management of the company and the guys out of support, or even to look for a new software. How to automate the taxi dispatch service? You can fill out an application on the site. We will answer all your questions. We will find out the equipment of your service at the current moment and provide full information about what you need to do or, possibly, purchase, so that we can quickly connect your business to the program. All work is done remotely. Technical support is available 24/7 for free. How much does the program for taxi UPTAXI cost in the price menu. UpTaxi - raise up your taxi at new level. The site contains cookies to make it easier for you to use. By further use of the site, you agree to all cookies, in accordance with our Terms and Conditions.